And Another Thing...: Movin' On Up! PNB company members in George Balanchine's "Diamonds"
Congratulations to Pacific Northwest Ballet dancers Leta Biasucci and Jerome Tisserand. PNB Artistic Director Peter Boal announced their promotions at the company's opening performance September 26, 2014. Jerome Tisserand moves up to his (rightful) place as a principal dancer. Tisserand is one of those classically beautiful dancers, the kind of guy who looks exactly like the prince he portrays. PNB hasn't had anybody so princely in its principal ranks since Lucien Postelwaite left for Ballet de Monte Carlo. 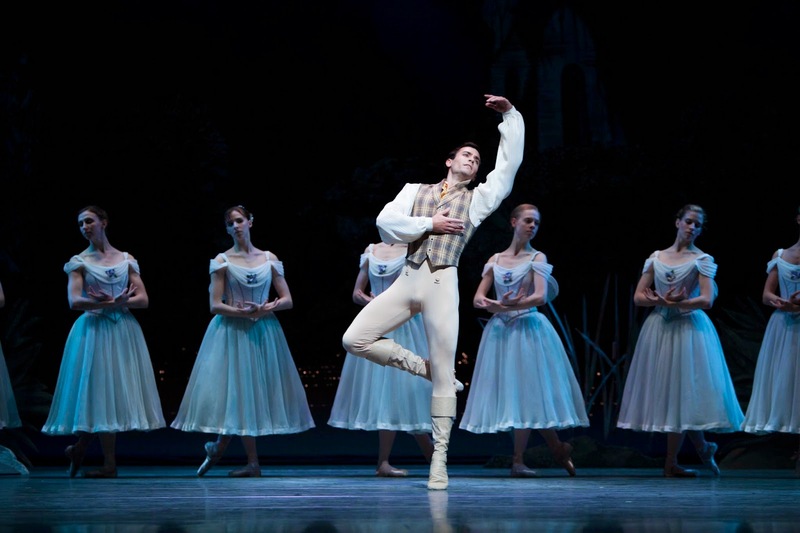 Not only is Jerome Tisserand a beautiful dancer; he's one of the nicest people at PNB. I'm delighted that he'll finally own the title that fits the performances he gives. Woot Jerome! I wrote about Leta Biasucci last spring. She's a tiny dynamo with a mighty stage presence. She is now a soloist with the ballet company, and in her opening night performance in George Balanchine's "Rubies", Biasucci dazzled with a charisma that was multiplied ten-fold by her partner, the effervescent Jonathan Porretta. PNB Soloist Leta Biasucci as Clara in Stowell/Sendak "Nutcracker"
Porretta and Biasucci are an inspired partnership. Both dancers are compact and dark, so they make a nice physical match. But more than that, in this rendition of "Rubies", they sparkled and snapped and, for me, stole the show. For those who haven't seen all three parts of "Jewels" on a single bill, briefly: "Rubies" is the savory, syncopated filling between the almost wistful grandeur of "Emeralds" and the full-scale splendor of "Diamonds". (By the way, Carla Korbes and Batkhurel Bold were splendor personified in their opening night performances). PNB Principal Dancers Carla Korbes and Batkhurel Bold in George Balanchine's "Diamonds"
The audience went wild for "Diamonds", but for my money, Porretta and Biasucci stole the show in "Rubies." When Porretta smiles onstage, he lights up the cavernous McCaw Hall. He's at ease in "Rubies", and he clearly passed on some of that confidence to his young partner, Biasucci. PNB's Leta Biasucci and Jonathan Porretta in George Balanchine's "Rubies"
Early on, she was intent, almost serious, precisely executing Balanchine's choreography. Midway through, though, she relaxed, cracked a grin, and her performance took off. What a excellent start to PNB's new artistic season. Dance on, ballet dudes! Initial D Stream Movie Secrets That No One Else Knows About Action | Free Movies & TV Shows Online - Putlockers - Putlocker.cash.